My goal was to use Arduino board to drive a stepper motor (from an old printer) that would be controlled via PC or hand held remote. Bipolar stepper motors can not be controlled directly with Arduino board so I had to use additional driver circuit (Allegro A4983). Ardunio feeds driver with three signals: step, enable and direction which determine the angular speed and direction of rotation. Remote has six buttons but so far only four are used for increasing/decreasing speed and movement control. Computer communicates with board over RS232 port with ASCOM drivers made by ejholmes. ASCOM standard is used in many astronomy software like MaximDL, Sharpcap,.. so you do not need additional software to control focuser. 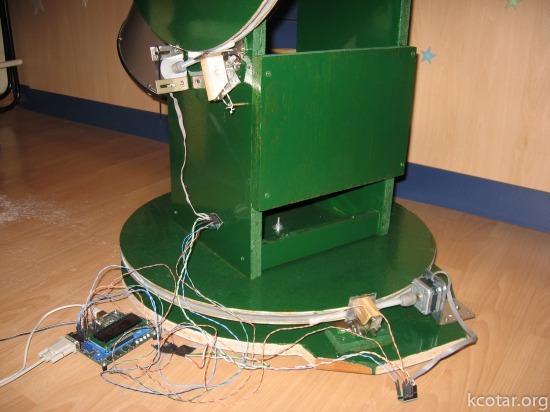 Focuser works better than expected and is mainly used during imaging planets and DSO objects. Focusing by hand at that time is less accurate and almost impossible. The whole project costed me few € because I already had everything at home except a shaft coupler.Link to a source code for the focuser. Fell free to use, improve and comment, your feedback is desired. Here is a picture of my telescope focuser with one of the focuser knobs removed and motor focuser attached instead of it. The motor’s and focuser’s shaft are joint directly by a shaft coupler. Motor and circuit attached to focuser and telescope, ready for test under clear sky. 6-button remote, connected to Arduino by two 4-wire stretchable telephone RJ11 coiled cables. Here is my attempt at making a DIY Go-To dobson mount, using two old stepper motors taken from printer. At microstepping and low rotation speed they have more than enough torque to move the wooden mount including telescope. 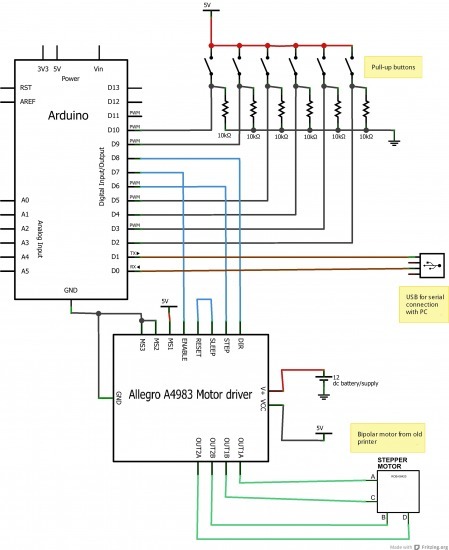 Motor control is done using two Allegro drivers and Arm7 microprocessor. Prior using Go-To capability, software needs position of two reference stars. It is also necessary to provide a flat levelled surface for the mount. Finished mount, with all the circuitry and wires visible. The hardest part of the build is making a worm drive or something similar to it. 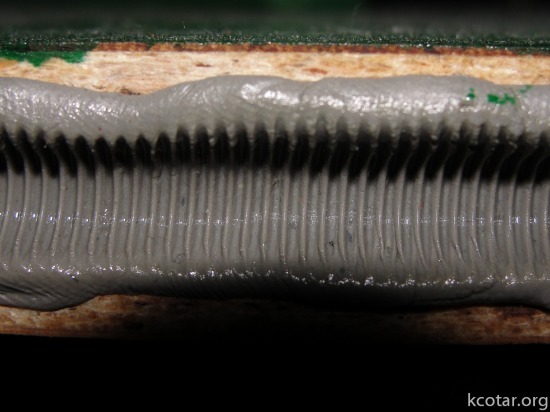 After some testing I decided to make a grooves in worm wheel using two-part epoxy repair putty. As a worm and its shaft I used nylon threaded rod. The final product was in use only few times, enough that I determined its pointing accuracy and smoothness of movement. Accuracy of pointing to a desired object was within 0.5°, enough that the object was visible in 25mm ocular with ~1° of FOV. Smoothness of movement when looking through ocular, while the scope was moving, event at microstepping was not very good. The jerky motion between motor steps was visible. For this reason I never tried to upgrade software for object tracking.